"Growth and mastery come only to those who vigorously self-direct. of schooling are set up to prevent, on one pretext or another." Two things that schools and students tend to not do well: reflecting and enjoying privacy. And for vigorously self-directing, that is taken away by prescribed curricula and "teaching the test". Home schooling teaches these things when done properly. Does seem like he ought to know. Why do people continue to ignore thus deny reality? I was asked to speak at a Libertarian convention in 08. The first thing I said was, "We're all born Libertarians and we stay that way until the age of five. Then it takes 12 years of state education to beat it out of us." There was a great reaction with a lot of laughter...because its just Too True! John F Kennedy just had to start the Dept, of Education in Washington to gain federal control of the nations schools along with the federal courts. Everything was fine until then. Great to see JTG in Liberty Quotes at last. People are beginning to see through the lies. Kudos to J Carlton and cal, a fellow Texan. Even Waffler and Anonymous can 't deny this mans credentials. Mr Gatto is right. Classroom education is designed to get each student up to speed on a particular body of knowledge. This concept goes all the way through higher education. Most professional societies dictate the curriculum, ie AICPA, medical and dental groups, engineering etcetera. Thus a student is required to learn what has gone before. Education in the classroom and in books is the cheapest way to learn a profession or the skills needed for life. If an individual had to learn all that is in books and the classroom on his own by personal experience and experimentation without the benefit of those who have gone before and book learning where in the hell do you think we would be. 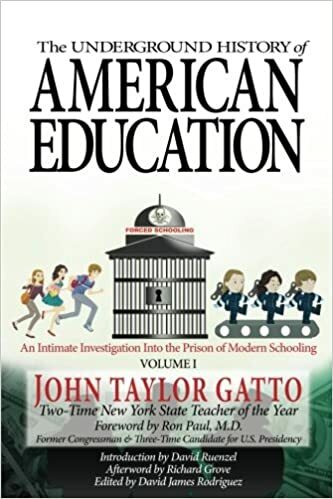 Gatto I understand taught in public education all of his life. The criteria Gatto refers to are not denied to public school children. They have libraries and parents to direct them outside of the classroom to museums etcetera. Some choose to be self directed and some don;t. Many educators of course want to make straight A robots out of everyone. I agree with him that self-directing, searching and questioning is the path to awareness, That school prevents this I dunno. Homeschooling is yet another form of child abuse. J Carlton, your post points out a deeper problem and that is once its beaten out of current students these students grow up, have families and beat the same into their children thus making indoctrination that much easier for the schools. Robert, you may be right. Teaching children at home with a substantive love that exists no where else without the limitations, mis-information, and brain washing of the statist theocracy's indoctination schools may be considered child abuse from a dumbied down slave's point of view. Loving to learn, becoming well rounded, excelling in all life's adventures, finding true freedom, becoming a functional family unit as is the healthy foundation of all societies, etc. all being indicative of home schooling is child abuse when the goal and standard is a statist theocracy. Robert, a question for you. Since such a small percentage of society home schools, why is there such a high percentage of home schooled student's in post graduate schooling, such as is the case at Harvard? Are you saying that Harvard promotes child abuse? ;-) (just for fun, that was a typical Waffler type conclusion) You've read what an amazing job Archer has done with home schooling his kids, and how my oldest started college at age 15; that is more the rule with home schoolers than the exception. Most parents are ill equipped to home school There have been "public" schools or group schools since the dawn of civilization. African tribes and stone age native Americans taught their progeny in groups to be hunters and weavers and basket makers. The best in the village would teach the youth their skill. Why or why do folk today think that mothers and fathers everywhere should be teaching their children algebra, chemistry etc. Home schooling is not about education at all but it is about controling a child and not letting him/her experience the world around him, creating a false little world right at home. Mike did you and Archer keep a picture of a kneeling in prayer Washington in your childs bed rooms. I believe Archer is a non believer so he probably would not do that. Mike in your home schooling system who writes the books. The parents don't some guru somewhere is still the primary teacher of your child. the parents are not the teachers just the facilltators. I again submit that the primary motivation is parental control and indoctrination in order to make the child into a carbon copy of SELF whom one thinks to be a pretty important, pretty intelligent, and a higher form of human being than those others over at that school.. I have found John Gatto's remarks to reflect my own experience in schooling (via public, private, religious, 'independent' schools). My own children have had a smattering of different schooling scenarios, from Montessori to Methodist to home-schooling, online schooling, and currently with a group of other homeschoolers following the program together, forming their own baseball team, making their own plays and presentations for parents, doing community service, etc.. I think what they've got going now is a great mix of many opportunities to learn, not the least of which includes all the online learning resources available. Institutional learning can only do so much and is geared to treating children like cattle -- obedience to non-parental authority seems to be the main thing they are instilling. It seems typical of Waffler to defend his narrow view of learning, but I am surprised at RBE's remarks as his exposition of the 'SELF' in previous posts seems to match what Gatto is saying. Am I a 'believer'? I have beliefs, and I keep them in the context of beliefs. As a seeker of truth, I find that most of what is found is untruth thus leaving an even greater unknown but certainly freeing oneself from superstition. I think Mike expresses very well his beliefs, and there is much 'gold' in there. Just as there is a tremendous amount of merit found in the Buddha sutras, Vedic texts, American Indian creation stories, Greek and Roman mythology, and yes, Science. Life is a grand mystery, and telling the truth is not as hard as trying to memorize dogma. When parents give up the responsibility of raising their children to the state, you can expect as good a job as the state-run post office, state-run medical centers, state-run motor vehicle department, etc.. Of course there will always be those special teachers in our lives that we remember forever (like Gatto). And that is what we look for now for our children, to find the best teachers/mentors for our children before they leave home to live their own lives. We are making sure that by the time they are 18, they will have many skills that can make them money -- they do not have to wait for college to learn a lot of what college is supposed to teach. Un-hypnotized children are indeed such bright lights, why would we ever send them to programming zones for others to mold for their own gain? It is the difference between collectivism and individualism. Waffler, I do have much more art work in my home than the subject painting. I believe the arts (all facets - music, literature, theater, etc.) are fundamental in appreciating self and others, learning of all subjects, and understanding other cultures. My children have learned of other religious persuasions (Atheism to Zen - including Greek and Roman mythology) from those qualified to instruct (such being unavailable to the current statist theology) I believe there to be great truths in all religions. Many truths are expressed far better in Buddhism than in Christianity. That doesn't change the truth, it only makes it easier to understand (not available in public schools because it is contrary to the socialist theology). I'm sure Archer's children know of the subject painting of which we speak even though he does not share my religious convictions. My children have all worked regularly with the less fortunate. In the sciences and math I am able to direct my children to those experts in their field that far exceed anything they could receive in public indoctrinations. All my children of age have started college by age 15 and are doing very well. That's not a statistic that compares well to public education. Home schoolers have much larger selections of books, teachers, learning experiences, etc. than any public school could ever hope to have. Public school kids have available to them all of the same resources as home schooled kids plus the public school. Public school is not some type of down and out poor orphan. Some in wealthier communities have Olympic sized swimming pools etc. Many parents examine the amenities of the local school system when deciding to buy a home. The wealthier communites High School facilities on occasion exceed the grandeur, scal and credentials of the many college campuses. I disagree with you jaded tunnel vision view entirely Mike. You are like that story about a man facing the back wall of the cave rather than looking and venturing out the front door. Again homeschooling is primarily motivated my the desire to create your child in your own image. I am not so sure that that is the best motivation. "Again homeschooling is primarily motivated my the desire to create your child in your own image." Says you, Waffler. Typical collectivist BS. It is the public school 'system' that creates Borg mentality drones. My children have their own ideas and inclinations -- the difference is that we allow them to self-direct, we do not use aggression or force to 'teach.' People learn, they need not be 'taught' unless they are asking for it. From Waffler's perspective, no one could ever learn anything unless they went to an institution. Our kids learn more from their own interest to learn, by observing those they wish to learn from, by actually doing instead of just reading about doing. They challenge our beliefs as well as embrace others. We promote personal responsibility, debt-free living (i.e. live within your means), courage, honesty, and compassion. Of course, we have to be the example, and their peers (and their familes) also have an impact. Socialized learning is boring, time-consuming, and mostly propaganda. Only 'failures' are expected to work for a living after high school -- the rest are supposed to borrow tens of thousands of dollars to get a 'college' education that any self-directed individual could get sooner and cheaper by studying on their own or with other like-minded. It is practically illegal for youth to get paid for working -- it disrupts the socialist plans for them. My kids not only work in local businesses for money, they also learn real skills that are not taught in school. Go ahead, do your worst Waffler, but my kids are smarter than you already. So much for your 'socialized' public education... You can keep your Olympic pool, our kids have been swimming since they were babies, and have a dozen pools to choose from, and they have a choice of numerous swimming experts to learn life-saving, scuba diving, water sports, whatever. My daughter was a certified scuba diver at 10, has advanced life saving certificates, and can out-swim us all -- and she never went to a school with a pool. So get over yourself, Waffler. And RBE, your comment about home-schooling being child abuse seems contradictory to your 'SELF'-centered philosophy. Waffler, funny you should mention pools. One of my children was rated 14th in the entire nation for an Olympic water sport. All those that were competing at that level had to drop out of public school while my child didn't miss a beat (started college at 15). Home schooled children are much more focused, well balanced and creating a substantive foundation for future society while so many of the lefters (currently politically correct phraseology) publicly propagated kids are still parroting statist theology and chaos. 90% of American students attend public school. In 2000 72% of those attendees were tested to be on track as far as their knowledge at their grade level. American literace rate was higher than European countries. European students were higher in math and science. However a study by one researcher fouund that "a slightly higher proportion of American adults were scientifically literate as compared to Europe and Japan". This would seem to indicate more self direction and learning after high school either in college or independently by Americans. Just a few morsels for the always adamant purveyors of ridicule and scorn for the way Americans have freely chosen state after state and communiyt after community to educate their children. I mean really put a sock in it and get a life. Enough of this "my kids are better than your kids" BS. You do not even know my kid Mike so how can you say that yours has a better education than mine. My kid went to church school through the 10th grade. Beyond that he was very self taught and very ambitious. He was a successful real estate appraiser until real estate went south last year. Now we owns a vary successful restaurant at a marina and has a beautiful home. I have met home schooled kids and my perception is that they are backward, shy and feel as if they have missed out on some very important aspects of life. "My kid just has a better education" what a terrible statement. PS: My public school and University of Delaware, Washington University educated nephew and his publicly educated wife are both Phds. in Computer Science and bio-chemistry. God Bless public education and those who learn and know how to thrive in it and through. Archer your best bet to learn about one great example of public education is to google "Woodworking with David Mathias" and take it from there. Even an old f' like you may be able to learn something from a public school person, if but only if, you will ever open your jaded cave facing eyelids. I disagree Mike you need to get out more and actually visit a public school campus. Yeah they don't brow beat the Catholic, Baptist, atheist, Jewish children that come to their classes. That is what the parents and the chruces are for. What the public school does is respect the childrens rights to their personal beliefs and traditions. Sort of like most adult places of work and gathering where private religion is not forced upon the adults. Most adults know that when you meet each other you normal discuss things in common, you look for commonality of interests and purposes. Why do you wish to treat children so dictatorially when you would not do that with adults, or would you? God Bless public education and its god given commitment to freedom versus dictatorship, even the dictatorship of God. Those who have received indoctrination from the state or church for a decade or more will usually not be able to see that they have been indoctrinated. Obviously I am not against education -- I am all for it! The complaint is that government schools are propaganda dispensaries -- along with the 3 R's, we also get the mindset of little goosesteppers who are corralled and queued like animals. It is one-size fits all. Yes, you can learn a lot in a public school, but you won't be guided towards anything that might challenge the school board or the unions or any of the other rackets furthered by 'public' education -- and private schools that accept government subsidies also have to have a government-approved curriculum. This is another reason why it isn't until some people are in their 30's or 40's before they learn what is really going on and what has been left out of their education. I am sure your nephew is a fine man, and I respect anyone who actually produces something tangible like carpentry or even computer programs. When I went to university for Computer Science I had a limited amount of money and after the 1st year, I started taking courses I wanted that were offered to Masters students -- the university didn't care, it's just that these credits wouldn't get me a degree unless I took all the other stuff, too. Frankly, most of the computer courses were for old legacy systems and languages and was geared to getting graduates into entry-level corporate jobs, not to hop-skip and jump over guys already in the workforce by having better skills and knowledge than a fresh graduate. I was done in 3 years, had trouble landing my first job, until I was hired on Wall Street for my expertise with the newly invented IBM PC -- which was not even taught in MIT at the time, but I had learned all about it on my own. Within a year I was making more than anyone I had known at school, and within 3 years I was making more than my parents combined -- and I was only 24. I learned more by actually working in the field and studying the new technologies and languages as they came out. A degree is needed for an entry-level job -- after that, it is what experience you have gained and how competetive you can deliver your expertise in the marketplace. I feel that the government school experience was overewhelmingly leftist, and most children are 'liberal' in their ideals -- conservatism usually shows up later when one becomes an adult after seeing the foolishness of being a permanent child of the state. I don't pretend to know what a Phd in computer science is or does. I installed large frame general ledger computer systems in a hospital and in a two billion dollar sales corporation. Computer work got be burnt out, just too nerdy for me. My nephew bounced around in his 20's but again got a BS at age 29 was accepted at Washington University in St Louis (a private institution) and five years later he and his wife had Phd's. He is now a Senior Instructor at Ohio State University. He has co-authored books on education. One has the title "If You Can't Teach Them, Learn Them" or something like that. Fabulous woodworking furniture bldg in his basement is simply a hobbly. I don't buy you guys calling "public schools, colleges and universities" education by the state. Do you wish to say that the public is the state, if you choose that jargon then I will agree with you. But public education is much more diverse, free of dictatorial stances as are some other schools. In todays post M. Brown thinks that the founders were home schooled. Wrong! Jefferson went to Wm and Mary, Madison to The College of New Jersey now Princeton, and Adams went to Harvard which was started by the Puritans. The founders and 10's of thousands of their fellow contemporaries were highly educated persons for their day. I am sure the right wing crowd and nativists would like to think they all lived in log cabins and self-educated themselves, NONSENSE! I had a few good teachers but the vast majority would context most lessons in a leftist format. I always thought it amazing how Marx could be taught through calculus. There is no law school in the nation that mandates more that a semester in Constitutional law towards graduation because they say it isn't applicable anymore. At that, only stare decisis is taught with a few words like Jefferson or Madison thrown in for good measure. All that is taught is how to maneuver in a current socialist's interpretation of the way things should be. I had an 8th grade history teach in public school who stated his opinion that the US Army was a form of communism. Now was that public school free for teachers to express their opinion or was it some kind of "state" controlled institution. What most parents and folk on this site are in afraid of is the fact that they or persons of their choosing are not controlling and teaching their children. At heart their afraid that their children may actually be FREE. Free of them and their little limited inward looking world. Waffler, you never cease to amaze me. Your inability to comprehend anything outside your little slave mentality box with everything needing to be demonstratively controlled, feared, licensed, or compelled. Your definitions of terms, words, concepts, perceptions, etc. are unceasingly skewed to accommodate, a never have to venture outside your little slave box mentality. My choice would be that a teacher be able to express any given subject matter with the least restraints possible (a teacher's rights end at my child's nose kinda thing) Opinions are great, including yours and mine, when given in that context. I would have my child reach an appropriate level of maturity, intellect, age, etc., so as to learn of all, or at least many religions (Atheism, socialism, etc.) and differing life styles. What you call fear, is more a feeling of offense to moral violations - proselytising a child with theocratic propaganda, killing, or at least burying very deeply, any spark of freedom and liberty. I understand by your writings that real freedom and liberty, not having severe theocratic restraints, scares you beyond reason but, I, nor my family, care to dwell in that box. I strive for my child to be personally responsible and free in an unlimited world. You understand wrong Mike. The example of a school teacher in your so called state school told me and my classmates that he thought Army life was a kind to communism. I have never forgotten that and I may or may not agree with him but he said this in a state school which supposedly supports the states Army. What does that example say about your position that state schools express only state propaganda. I honestly believe that your entire thesis is wrong. How you came by your logic that public schools, colleges and universities in this country support some propagansistic party or state government line is way beyon me. I do not ever expect you to explain yourself. Just continue on in your delirium.. I was too busy learning to put any thought to school.A garage,a tool box, a world! All I ever needed to know is how to read,and have comprehension.I form my own thoughts and opinions,I do not need anyone to school me in proper thought. Waffler, ?, Are you saying that Communism isn't enforced through its military and, its not a part of its propaganda? Are you referencing the founders' intent to have no standing army? Waffler, you really make me laugh way out loud. You are a poster child for the indoctrinated prideful ignorance of the statist theocracy's dummied down line (will not accept law, facts, history, or truth - only a slaves desired facade. Mike I am saying that a teacher in your so called state school in around 1957 which would be about 8th grade stated his opinion that Army life is like communism. Now how hard is that event to understand and how thick headed are you really? In your opinion does the fact that a teacher appears to teach something counter to the states principles of military draft etcetera seem to indicate that counter to your opinion that public or state schools support a party line or line dictated by some sinister force that you call "the state", that public school teachers (state school teachers) are perfectly free to teach in accordance with their conscience rather than some state control. You are the thickest person I know. There are a wide variety of homeschoolers, just like schooled people. Some do great, some don't. What homeschooling offers is time to think. Time to get up and move around if you feel like it. Time to go on field trips. Time to develop deep and lasting bonds with the family. The family is truly the only unit that deeply cares for an individual. Friends are fleeting, family is permanent. My son was homeschooled until 10th grade. He made the adjustment to high school just fine. He was able to discuss and debate matters and challenge his teacher and fellow students. He has his own opinions, he did not espouse my opinions. He and I debate things all the time. We do not agree politically but I don't care. He has made up his mind on things by himself. He did well enough in high school to get $30K a year in scholarships to a very good liberal arts college. He is doing very well there and after 4 years there has presented papers at national and international conferences, things only grad students usually do. Homeschooling is not perfect but it does work for most people. Judging from the extensive commentary one can see the extent of this subject's importance. I can generally agree with the premise of the writer's opinion. I do not however take it to the point of paranoia wherein those in "power" conspire to deny the "po-folk de ri to de edumucation". It has been my experience, as a so-called educator, that the vast majority of people want only sufficient education to get by at minimum effort. What is wrong with that ? No one can teach desire, curiosity or intellect. IQ is not equally distributed across humankind. Certain of us have more brain power than others. Certain of us have more physical dexterity than others. Certain of us are more "talented" in one area and "vive la diffreance" It simply goes to prove that none of us are completely self sufficient and we need each other to survive. Does it come as a shock there is a difference between intellect and wisdom ? Then the question of "common" wisdom versus derived or experiential wisdom as opposed to... Common public education cannot touch on most of these human growth and development aspects for both economic and social reasons. Those social reasons have to do with the separation of church and state or the required impartiality of state values (non-values) in light of a so-called impartial, diverse, society. We are stuck, despite ourselves and those of us who bewail the lack of ideal, individual educational excellence are in the wrong. Pursue that for yourselves and others of like kind; then be generous to all you meet and work with expecting nothing but basic production requirements common to all. Stop whining about human nature and quit kissing your self-congratulatory brain. The worst of homeschooling cannot be less educating than what you get at most public schools. Within such a competitive society as America, most do not perceive the cutting edge of understanding, regardless of field. Prosperity begins with education. Tricks of tradecraft are always guarded from competition, leaving many in the dark. Through teachings experience one finds there are those who should remain in the dark. In promoting peace and prosperity through independence and the responsibility of Liberty, one must keep a watchful eye on tyrants, big and little. Quality and excellence are paramount, concerning product. Some are better than others. Individual Sovereignty is a product, most Excellent, of Liberty and Freedom and must be well defined. this the public educational system through manipulation neglects. It is not to ask why, but remove those who would perpetrate such treason against our Free Popular Republican form of government.